Ruth started her journey with Why Weight Ireland at the end of 2012, and just over a year later she is still going strong!! Of course there are many ups and downs which anyone who battles with their weight will understand but she is on a mission to succeed and so far has lost an impressive 3 stone! She was understandably nervous about sharing her story so far – but I just know that like myself, reading other peoples stories give hope and inspiration that positive change IS possible. Ruth is starting to believe in herself and the changes are showing both in the confidence and in the transformation in the photographs. I feel I know Ruth personally through our email conversations over the last year and although we haven’t met yet – I KNOW that it won’t be long in coming face to face with another success story when she hits her goal weight and comes to put her handprints on our “wall of success” in the studio. Why did you decided to lose weight in the first place? I suppose my “journey” about my weight (gains and losses) is similar to most overweight people, starting along the lines “I’ve always been overweight”, to be used as a kind of rationale for being overweight in adult hood, but when I look back at photos of when I was a child, I wasn’t “always” overweight, but my perception of my myself has always been that I was huge, have always been and will always be, so what’s the point? A real defeatist attitude, switching to “I can do this, I’ve lost weight before, I can do it again”, but I would never start. Another line you hear a lot is “I’ve tried every diet under the sun”, I can’t say that, I’ve never believed in fad/crash diets. I’ve tried slimming groups, being a member 4 times and lost weight doing it, but I’d have a 5 week threshold and bam, I’d start the routine of self sabotaging. I’d go at it hammer and thongs and give it my all, but after 5 weeks, I’d feel deprived, that I was missing out on something and give myself a treat…Treats – they were always food, and then I’d start thinking “Sure what’s the point, I’m fat, I’ve always been fat”. Saying all that though, my weight has bothered me a lot, obviously if I’ve joined slimming groups, but more so in the last few years. I hated any social occasions, the thought of trying to find something to wear that didn’t make me look like the side of a house, what other people might think of me being overweight. I’ve watching all the weight loss reality tv programs for years, but still didn’t stick fully with them. All throughout this, I rarely spoke about my feelings about my weight, I felt it was my problem and I had caused it, and if my health was affected by it, I wouldn’t go to the doctor because I deserved to be ill for being overweight e.g. back pain, sciatica, i.e. don’t be complaining about a problem that you have caused yourself. A real harsh attitude to take on yourself, punishing, not deserving, unworthy. But to most people I was happy Ruth, self assured, confident, carry on a conversation with people, inside I was anxious over what people must have thought of me based on my physical appearance. My clothes were getting smaller, my wardrobe already limited to what fit me, fashion played no part in my life, if it was my size and didn’t look too horrendous I wore it, but it was as if I could feel myself getting bigger by the moment. Even small things like getting up off the couch were becoming difficult. I knew I needed to lose weight, wanted to lose weight, but this time, it wasn’t for any occasion i.e. a wedding, family occasion, but that it was for ME, I was resolute that I was going to make a change in my life which would make a big difference to me. I knew people who had started total food replacement (TFR) diets and elimination diets and saw the results they were getting, but knew it wasn’t for me. I had tried a TFR before my wedding and didn’t even last 1 day, the shakes were fake tasting and awful and all I could think about was food, my mood dropped and I was like a wagon all day. I felt like such a failure that I couldn’t even succeed at drinking shakes. During the summer of 2012, I was given old issues of women’s magazines for baking (ha) recipes. It was then I read (by chance) an article in about Hannah Nolan and Why Weight Ireland. I was in awe that a “real” person could do this but also somewhat envious. It seemed more believable because it was an Irish story about a real woman, mother and wife, who had started her own journey, and it had not only changed her physical appearance but her life and career. I googled Why Weight Ireland and read more online but did nothing further. Fast forward 5 months to November 2012, my weight was really getting me down, constantly bothering me, I’d say I’d start to do something on Monday, but Monday never came. I looked into rejoining the slimming group again, but I couldn’t make the meeting times. It was then I remembered Hannah and Why Weight Ireland. Six months previously I had bought a fancy schmancy digital weighing scales, but it wasn’t until that night in November when I was alone at home, that I decided to step on it. I had a figure in my head (from over 6 years previously when I was last pregnant), as I stood nervously on the scale waiting for the dreaded number to appear, the figure flashed up, but nothing registered with me as it was in lbs. My heart rate was racing a bit, but nothing in comparison to when I converted the figure to stones and lbs. I was 16 lbs heavier than when I had been nine months pregnant! I was disgusted, well and truly horrified and ashamed that this had happened and I seemingly was not aware of it. But of course I was aware, my clothes were tighter, the inside legs of my jeans fading from rubbing together, difficulty turning over in bed, getting up off the couch, laboured breathing climbing the stairs. Angry, very very angry. It was past midnight and I couldn’t ring my sister to run anything by her, so I took the first step and joined Why Weight Ireland. After reading the testimonials and success stories from members, I was even more convinced that this was the life raft in the my out of control storm of obesity. The comprehensive food diary was a big factor/draw for me, in my previous attempts in other slimming groups, I knew my successes lay in tracking what I was eating. If I wrote it down before I ate it, I was accountable but could also see what I had eaten already, so I couldn’t conveniently forget a snack here or there. The diary was just perfect, it did everything for me, all I had to do was to add my food & drink in. When I take something on I like to do it to the best of my capabilities, give it my all (hence the weight gain and giving food my all…), so I studied the food diary inside out and upside down, entered in all my favourite recipes, but when I saw the calorie and fat content of them, they were thrown out the window (Oh how I miss carrot cake with butter icing 🙂 ) My initial reason for joining was weight loss, to get to a certain size and then I would be happy. Exercise didn’t factor in at all, eat myself slim etc. Oh, how naïve I was! Hannah prepares an individual tailored fitness plan for you and you also have access to fantastic online video workouts so you can do full class workouts at home. I was taken aback a bit, exercise was not something I was particularly jumping for joy about, but needs must, so gradually I dusted off the 4 year old uber expensive coat rack aka the treadmill and got my runners on. It was through Hannah and the Why Weight Ireland FB community that I got interested in running, or in my case jogging and heaving! I downloaded some exercise apps and off I was. There is no diet, it’s healthy eating and healthy choices, but with the food diary, you can see how much you’ve spent and how much you’ve left and the responsibility is left with you. There are hundreds of community members recipes, but you can also enter in your own family favourites and modify and adapt them to get them to the right calorie content for you. Did you fall down and get back up? Between illnesses, injuries, family occasions, Christmas and summer holidays, I’ve fallen down a lot, not meeting my weekly targets, so the loss has been slower than I initially planned, but the one thing I have always maintained is physical activity. If this had happened before, I would have reverted to the old way of thinking, what’s the point etc. and self sabotage, but not any more. I’ve maintained and lost and am still loosing. Knowing that I could contact Hannah at any stage by e-mail was a real security, I could be as open and honest with her, and of course I’d try a few excuses, but she wasn’t having any of it. The encouragement and motivation she gives is second to none. For me personally, it was vital that I was accountable to someone else, left to my own devices, I’d try to cod myself and give into the excuses. I’d only told a few people that I had started to take my weight in hand, it was the first time having a real conversation with people about how I’ve always felt about my weight. How was your journey getting from where you started to this point in time now? Looking back to where I was before I joined Why Weight and now, the change is absolutely massive, not just physically but mentally and emotionally. My thinking changed and I became more confident in my decisions, I didn’t have to ask people for their opinions before I made a decision. In April I joined a fitness program in my local gym, I didn’t ask any friends or family what they thought, it felt that it was a natural progression. I had been walking/running at home but had hit periods where I wasn’t loosing weight, going off the grid and avoiding e-mailing Hannah but felt that this would motivate me even further. The program was 12 weeks and I did a second session as I really enjoyed the group environment and the variety of exercises. There were evenings I didn’t want to go to the gym but would go as I didn’t want to let any of the group down or be judged as a failure/not committed enough. It gave me the confidence to join the gym as a member, all the stigmas I had previously associated with gyms was gone, I had the confidence to use the equipment/machines, not feel as if I was being judged as being the “fatty”. I also started attending exercise classes with “normal” people. I was so nervous starting my first class, but a few of the girls, whom I’ve made good friends with on the program also started, so it felt like an extension of the program. As a mini group, we decided to still meet up two other evenings a week ourselves at the gym and do our own circuits/ routine. So at the moment I’m going to the gym 3 evenings a week. There are some weeks where I mightn’t make the 3 evenings and end up doing Hannah’s online workouts at home, but all in all physical activity is a part of my life. I like how I feel after exercise, the buzz of achieving a new goal, pushing myself to try things I would never have even considered before. Having other people in the similar situations to you is a big support. I’d tended to downplay my weight loss till recently, believing that I hadn’t gotten to my final goal and ultimately wasn’t successful. Don’t get me wrong, I’d see the loss in my clothes, I have given away or thrown out most of my wardrobe, relying on my sisters’ hand me downs as I don’t want to be spending money on clothes that won’t fit me in a few months. I couldn’t fully accept peoples compliments, I respond with “thanks, but I still have a lot more to go”, that wasn’t until I was shopping a few weeks before Christmas, on my own I might add, which is also something I would never had done before and I bought a dress, off the rack! The last time I bought a dress willingly was for my wedding. Even at that I was trying to come up with reasons for not wearing a wedding dress. The next was a black tent of a thing for a wedding. So all in all I think before that day I’d only ever bought 3 dresses – my debs dress, wedding dress and tent dress ;-). I didn’t need my Trinny and Suzannah with me aka, my sister and friend Sandra. I was confident in how I looked and liked what I saw. Now, having people come up to me and say how good I am looking and paying compliments is a real spur, even more motivation to keep going. What weight I’ve lost, will never come back. I have more to go but I am fully secure and firm in the knowledge that I WILL get to my goal weight, it wasn’t last year and it may not be this year, but I will get there. This isn’t a fad, or a crash diet to lose weight for an occasion, as Hannah’s says, “it’s not just a diet, it’s a new way of life”. There’s no looking behind but only forward. Along the way I’ve had many pitfalls, made new friends and gotten more involved with my community. How did you start to change how you felt as the weight came off? And how do you feel now in comparison to when you began? When I started on this path, a real sense of inner confidence came about, on the outside people would still see an overweight person but I was self assured in the knowledge that I was taking control and doing something positive about my weight, and that’s what made me confident, knowing that I was finally doing something. Before the switch was flicked and I finally started doing something about my weight, I was outwardly confident, happy, self assured Ruth, but inside I was completely unhappy about my weight, I felt that I didn’t warrant spending money on myself. How could I justify spending money on the hairdresser or branded make up when I felt I looked horrendous, no amount of hair or make up was going to make me look smaller! If I as an adult was not going to make a change to my lifestyle to lose the weight and get healthy and active, then I was not worth anything. How could I take any pride in my appearance? I look back at the rare few photos I allowed people to take of my before I started on this path and am gob-smacked, not just at my weight but that my perception of myself was so distorted. I was obviously extremely overweight, and didn’t like the pictures but I didn’t have the sense of horror I have now, it’s because when I looked in the mirror I thought I was bigger than what I was, so when I saw the pictures, I did see a very overweight me, but felt I didn’t look as big as I thought I was. Absolutely twisted thinking! It’s a completely different story now, I’m secure about myself and my appearance, I’m not particularly concerned about other peoples opinions about how I look. I’m not worried anymore about people’s first impressions of me. There is one downside though, at Christmas I may have taken to socialising a bit too much, I really looked forward to going out, having fun, catching up with people. Not hiding away in my home, making excuses why I can’t go out. I’ve reigned it in now and knocked it on the head for a spell :-). Losing the weight so far has had enormous positive affects on both me and my family. I’m more involved in sporting activities with my children, I’m so much more happier. If I miss an evening at the gym, the boys aren’t long asking me “Why aren’t you going to the gym tonight Mummy?”, it’s a part of our family routine. I couldn’t have done this without the support from my husband, Declan, I’m out 3 – 4 evenings a week now, and he’s never once moaned about it. He’s there to make dinners, put the boys to bed, supporting me all the way. I set myself a goal in April of completing a 5k, and I did it!! My sister joined me for support and together we did the Pieta House Darkness into Night 5k in Cork. As big as I was, I did it, I felt so nervous, worried what people would think I started into a run, would the t-shirt fit etc, but it felt right. I achieved one of my goals whilst also supporting Pieta House. This year my sister and some friends will be doing it with me again, we’ve decided to turn it into an annual event we can do together that doesn’t involve shopping, eating or alcohol :-). How do you feel about your journey going forward? I am determined to get to Tinahely, meet Hannah in person, put my hand prints on the wall 🙂 and meet some of the Why Weight Ireland Facebook Community members, whom I’ve also looked to for inspiration. 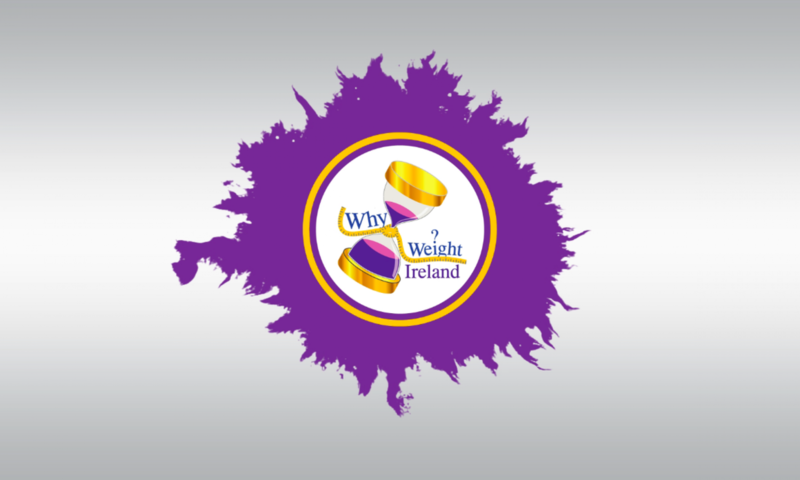 I highly recommend Why Weight Ireland to everyone, if you are ready to take the first step in making a positive change in relation to your weight, Hannah will be there all the way helping through the ups and downs, taking each step with you until you are up and running by yourself.